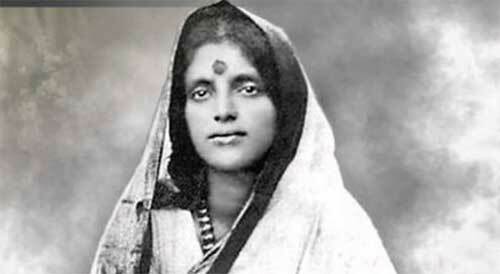 Sri Anandamayi Ma April 30, 1896 – August 27, 1982) was one of the greatest spiritual figures of the 20th century. Sri Anandamayi Ma quotes are mostly from books, magazines, newspapers and videos. These collections of 108 quotes are based on Sri Anandamayi Ma teachings and have been collected over a period of 12 years. 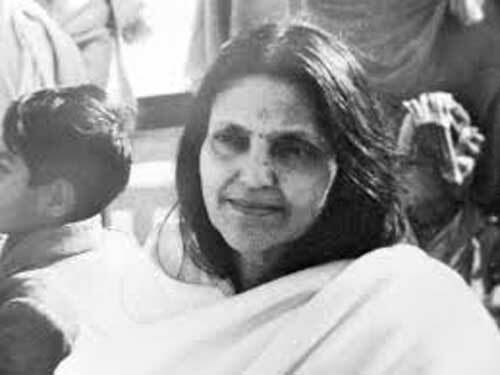 Born as Nirmala Sundari, the name Anandamayi Ma was given to her by her devotees to describe her perpetual state of divine joy. It is impossible to continue on the spiritual path without some inner experience occurring. The whole of manifestation is but a display of GOD's divine power — GOD Itself as vibhuti (creative power). Forgetting that GOD is the sole Beloved, one has come to love sense objects. If you examine yourself, you will see. There is beauty in the birds and in the animals. They too eat and drink like us, mate and multiply; but there is this difference: we can realize our true nature, the Atman. Having been born as human beings, we must not waste this opportunity. At least for a few seconds every day, we must enquire as to who we are. It is no use taking a return ticket over and over again. From birth to death, and death to birth is ‘samsara.’ But really we have no birth and death. We must realize that. Exert yourself to the limits of your power, however feeble. He is there to fulfill what has been left undone. Unconditional surrender to Him is the best solace for man. God's name is He Himself - The name and the named are identical. The more one thinks of one's Ishta (beloved Deity), the firmer will one's faith in Him grow. You will have peace only if you rise above worldly desires. There is nothing in this world, yet everyone is madly pursuing this nothing - some more, some less. Man is no other than the Self; but he wrongly thinks of himself as a separate individual centered in his body and identified by a particular name. Love and serve your consort and children as Divine manifestations. Perform all work as God's service. Do not allow your mind to wander here and there. Endeavor to make it one pointed. Have one single end in view. All sorrow is due to the fact that many are seen where there is only one. Duality is pain. So long as man does not wake up to his identity with the one, the round of birth and death continues for him. Time devours ceaselessly. No sooner is childhood over than youth takes its place – the one that swallows up the other. This occurs so slowly that one hardly notices it happening. But in reality, appearance, continuance, and disappearance occur simultaneously in one place. Everything is infinite; infinity and finitude are indeed the same. There is one thread in a garland, yet there are gaps between the flowers. It is the gaps that cause want and sorrow. To fill them is to be free. Do not set your hopes on anything less than supreme beatitude. The life in the world is to be on the way to Self- Realization. Everything originates from light and everything in its essence is light, even You. The quest after truth and to be Truthful is a human beings duty. Do your utmost to become anchored in Truth and spend much time in the contemplation of the Lord in a quiet secluded place. Human beings have to be dwellers of the Inner Cave so that the Supreme Being who resides within may be revealed. Blame may be likened to cowdung. When it lies about just anywhere it is of no use. But when, mixed with earth and turned into manure, it is put under plants, what lovely flowers, fruits and grain will grow due to it. Similarly, if an aspirant can bear to be blamed and criticized, that is to say, if he uses it to improve his character, it will be beneficial – just as the soil is made fertile by manure. No attempt is futile; everything serves a purpose. Suppose you are traveling somewhere by railway. In order to catch the train you have to first go by boat, then descend from the boat, get into a horse carriage and then catch a bus which will take you to the station. Although your aim is a journey by train, you cannot say that the boat, horse carriage, bus and so forth are of no use. Similarly you should understand that everything you do in order to realize God is helpful. Nothing at all is waste. By whatever Name you may invoke Him, you effort will be crowned with success. The main thing is to cling to the Name with constancy. Everyone thirsts for peace, but few people understand that perfect peace cannot be obtained as long as the inner soul is not filled with the presence of God. Man’s mind is clouded by worldly ties. But there is no cause for despair. With purity, unflinching faith and burning eagerness go ahead and you will realize your true Self. Sense enjoyment acts like slow poison. You are driven thereby towards death. Therefore, it is man's duty as a human being to get into the current that leads to immortality. Your sole duty is to remember that He alone is, and that everything is His doing. "Invoke Him and be constantly intent on realizing Him. With earnestness, love and goodwill carry out life’s everyday duties and try to elevate yourself step by step. In all human activities let there be a live contact with the Divine and you will not have to leave off anything. Your work will then be done well and you will be on the right track to find the Master. Just as a mother nourishes her child with all possible care and affection and makes him grow up into a healthy boy and a handsome youth, so you will find the subtle touches of the Divine Mother shaping your inner life and making you reach your full height and stature. The lute of man's short life is strung with so many strings; they have to be cut asunder. There is no real substance to these many strings. It is futile to let one's thoughts be occupied with the ties by which one is bound. Why behave like a fool and return again and again to this world of illusion? Whatever work you have to do, do it with a singleness of purpose, with all the simplicity, contentment and joy you are capable of. Thus only will you be able to reap the best fruit of work. In fullness of time, the dry leaves of life will naturally drop off and new ones shoot forth. Householders should emulate the ancient rishis (sages) who were married men living with their families and leading a life dedicated to God. Just as fire burns away all dross and rubbish, so the three fold suffering purges man's heart from all impurity and results in a growing single mindedness in his search after Truth. When he becomes deeply conscious of his weakness and tormented by the thoughts of his undesirable impulses and distressing characteristics, when afflictions like poverty, bereavement or humiliation make him feel his life is futile, then and then only does he develop real faith and religious fervor, and becomes anxious to surrender himself at the feet of the Supreme Being. Suffering should therefore be welcomed. Never does the soft moonlight appear more soothing than after the scorching heat of a summer day. One is born to experience various kinds of joys and sorrows according to one's desire. For the time being, God comes to you in the disguise of suffering. He is purifying you in this manner. The suffering is for your own best. A mother gives a slap to her beloved child for its own good, in order to keep it on the right path. When a fond mother gives her baby a bath, the child may scream desperately, yet the mother will not let the baby go until she has thoroughly washed and scrubbed him. Happiness that depends on anything outside of you, be it a wife, a child, money, fame, friends cannot last. But if you find happiness in God who is everywhere, all pervading, who is your own self, that is real happiness. Renunciation is the giving up of the idea of separateness, not the giving up of things. A spiritual traveller must not allow his mind to be distracted by anything. He should proceed with determination towards his goal. It is but the self that calls itself, and none other than the self that realizes itself. Relative happiness, that is to say, happiness depending on the fulfillment of any worldly desire, ends in grief. Among all creatures, man alone has been endowed with the capacity to realize God. Who am I? This realization is the purpose of human life. Control your desires for sense objects. Be moderate in eating and sleeping. As a pilgrim on the path to God, you should be content with such food and sleep as will help you to remain fit for the onward march. Whatever may be your short comings, don't be depressed, don't lose hope. Try to improve yourself. By God's grace one is born as a human being. Try to make the best of this opportunity. Everything is possible for man. The highest satsang is to have the company of the one true Self. The second is to enjoy the company of those who have realized this. The third is the company of a profound spiritual book. Remain in the company of the enlightened ones and as the sun sets fire to the sky, the fire of their wisdom will burn your ego to ashes. He is in all figures and forms, eternally enthroned in the hearts of all beings. It is true, He lives everywhere. Once one has achieved to see this, then one has seen and achieved everything. It means, to be fearless, sure, devoid of all conflicts, completely silent, imperishable. Peace can be promised only then, when the mind is concentrated on what give us peace, and the eyes rest upon what strengthens peace, when ears listen to what fills the heart with peace and when you hear at all times the answer of the One IS himself peace. It may be tiresome in the beginning to live in harmony with the highest ideals, but finally, it leads to a genuine sense of well-being and peace. One must learn to find joy in the sublime. If one is blessed with a human body, it is wrong not to live accordingly. Why should one go after animal instincts? "Who am I? This realization is the purpose of human life." The positive proof that the aspirant is centered in GOD is that one ceases to hate any person or object and that good qualities such as Love, Forgiveness, Patience, and Forbearance go on increasing in one. Truth Itself will assist in every way one who has gone forth in search of Truth. Thinking of anything other than GOD is what creates sorrow. The mind does not obey me; very well, I shall not obey the mind either; I shalt continue to repeat the Lord's Name. All sorrow comes from the sense of I and Mine. All sorrow is due to one's keeping apart from God. Be anchored in fearlessness. What is worldly life but fear! Our mind is the swiftest thing in creation. Let the mind move at its own speed constantly towards the One Aim, which is God. Light is also in you, since it pervades all things. Everything originates from light, everything is in its essence is light. Since the body is bound to get hurt at times, there must be suffering as long as one is identified with it. My conscious has never associated itself with this temporary body. Before I came to this earth ‘I was the same.’ As a little girl, ‘I was the same.’ …. Ever afterward, though the dance of creation change around me in the hall of eternity, ‘I shall be the same’. Even when speech is suppressed, the activity of the mind still continues. All the same silence helps control the mind. As the mind dives deeper, its activity slackens off, and then one comes to feel that He Who provides for everything will arrange matters. When the mind is agitated by thoughts of worldly things, the benefit that should be gained by abstaining from speech is lost. When the mind is centered on God, it keeps advancing steadily, and along with this emerges purity of body and mind. To let thoughts dwell on objects of the senses is waste of energy. By constantly dwelling on the thought of God all the granthis (knots) that make up ego are unraveled, and that which has to be realized will be realized. To say 'through silence He is realized' is not correct, because Supreme Knowledge does not come 'through' anything. Supreme Knowledge reveals itself. For destroying the ‘veil’, there are suitable spiritual disciplines and practices. Whenever you have the chance, laugh as much as you can. By this all the rigid knots in your body will be loosened. But to laugh superficially is not enough; your whole being must be united in laughter, both inwardly and outwardly. Do you know how this is to be expressed? You literally shake with merriment from head to foot; so that it is impossible to tell which part of your body is most affected. Questioner: How is the idea of a benevolent God compatible with ruin and destruction in the history of peoples and lives of families and individuals? Anandamayi Ma: Do you believe that God is the creator of this world and therefore its Lord? 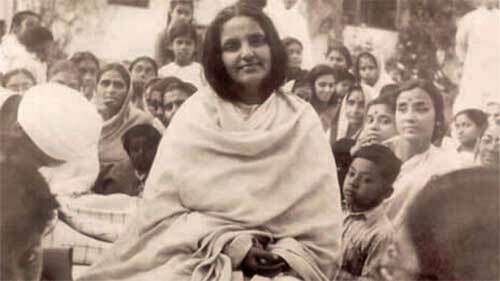 Anandamayi Ma: Very well, If God is the Lord of the world, He can do with it as he pleases. Suppose you have grown beautiful flowers in your garden, but decide to plant fruit trees in their place, won't you have to remove the flowers? If you have a fine house, but wish to build a larger and better one on the same plot, you demolish the old one. The freedom that is yours in small things, God exercises in great ones. In both is He, in destruction as well as in construction. The history of nations, families and individuals is the great Lila (divine sport) that He stages with Himself. By listening repeatedly to religious and philosophical discussions and discourses, the path to first hand knowledge of what has been heard gradually opens out. You know, it is as when water uninterruptedly dripping on a stone finally makes a hole in it, and then a flood may suddenly surge through, which will bring enlightenment. Be it the perusal of Sacred Texts, listening to religious discourse, engaging in kirtana – god must be the alpha and omega of whatever is done. When reading, read about Him, when talking, talk of Him, and when singing, sing His praises. These three practices are intrinsically the same; but because people respond differently, the same is expressed in three different ways to suit each person’s temperament and capacity for assimilation. Essentially there is only He and He alone, although everyone has his own individual path that leads to Him. What is the right path for each depends on his personal predilection, based on the specific character of his inner qualifications.